Barnabite Fathers of the North America now offers Online Giving! Online Giving is an option for all who wish to financially support Barnabite Fathers and their efforts. To Prepare the Basilica of the National Shrine of Our Lady of Fatima for the Celebration of the 100th Anniversary of the Apparitions of Our Lady of Fatima May 13 – October 13, 2017. 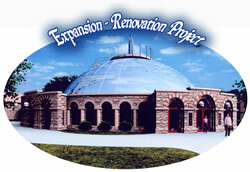 Our Lady of Fatima Shrine is preparing to undergo its most significant renovation and addition in over fifty years. Both the Barnabite Fathers and the Fatima Shrine Advisory Board have collaborated with architects and engineers for the restoration and design of 7,400 sq.ft. of space. Repairs to the Basilica dome and replacement of the sacristy are key components to restoring and enhancing the Basilica. Therefore plans call for razing the sacristy and constructing a new more functional sacristy and adjoining gathering space. The new 2,260 sq. ft. multi-purpose area adjacent to the new sacristy will include a reliquary gallery for displaying the Barnabite Fathers' historical collection of holy relics. Plans also include restoring both the Blessed Sacrament Chapel and Immaculate Heart Chapel, which have incurred extensive water damage. These chapels will then serve as votive candle rooms for the new chapels. A new ambulatory space will provide a separation between the main domed Basilica and the exterior. This space will also provide an area for visitors to experience the Basilica and the adjoining chapels without interrupting an ongoing service. The new ambulatory will also assist with controlling energy costs. New entrance doors and the design of the ambulatory will provide a more efficient use of the heating and cooling system, thus producing a comfortable environment for worship during both the winter and summer. The ambulatory will also contain lavatory facilities as well as other amenities. Lastly, the proposed construction of a new 100-seat chapel. This chapel will provide us with the ability to celebrate multiple liturgies simultaneously to better serve the needs of our various pilgrim groups.